Mark's wealth of experience and knowledge of business development and management ensures Blue Gecko is always striving to provide clients with the best experience. 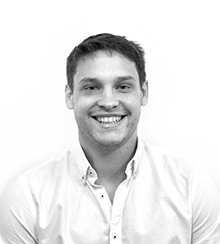 Focusing on developing client relationships and meeting targets, Mark oversees the running of both the creative and IT departments whilst always looking for opportunities to grow the company. Anna has 12 years' experience in the design industry. She has lived and worked in a number of countries including Abu Dhabi, Sydney and Egypt. Anna oversees projects ranging from traditional print-based marketing to exhibition graphics and online media. She has produced designs and led projects for many companies large and small including TOTAL, GASCO, Abu Dhabi National Oil Company and Alliance Français. Anna's understanding of branding and user experience across web and print is extensive, and is key to producing strong on and offline brand-led campaigns.